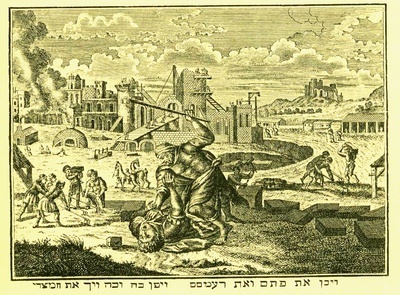 Moses Kills An Egyptian Overseer; a conventional North European Passover Haggadah illustration, reprinted mid-20th c. CE, Turkey. In accord with traditional, moderate, and spiritual Islam, the Center for Islamic Pluralism extends greetings to the People of the Book (Jewish and Christian) on their sacred holidays, Passover (Pesach) for the Jewish year 5772, beginning April 6, and Easter, April 8. "Say, 'We believe in one God and what has been revealed to us and to Abraham and Ismail and Isaac and Jacob and the Descendants and what was delivered to Moses and Jesus and what was told to the Prophets by their Lord. We make no distinction between any of them, but we submit to God.'" "And Moses said to them, 'My Lord knows more than you or me of who bears divine guidance and who will be rewarded in the world to come. Evil-doers will gain nothing.'"